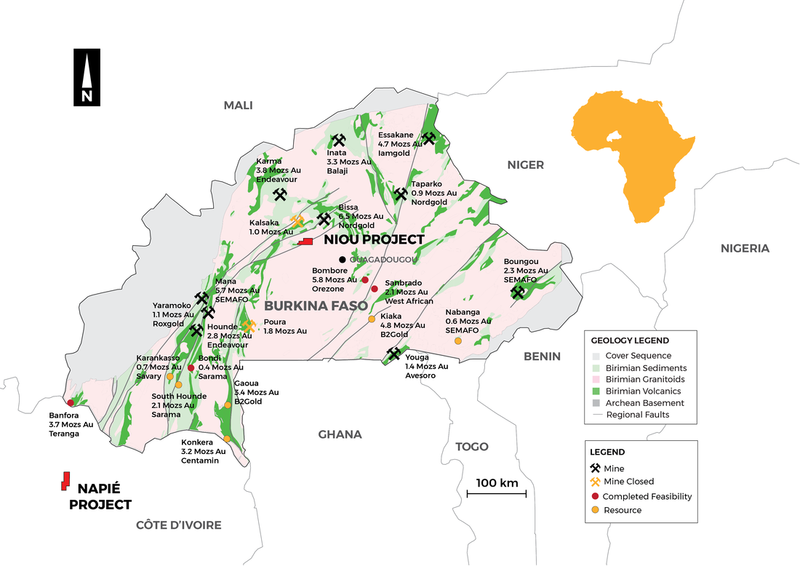 Mako Gold's Niou Project is located within the Goren Greenstone Belt, in the central part of Burkina Faso. It is 50km north of Burkina Faso's capital Ouagadougou it is easily accessed by a good road system. Mako announced a gold discovery from its RC maiden drilling program in January 2019. The RC drilling program was designed to test two targets (Target A and B) within a broad (1 to 2km wide) zone of shearing associated with a major regional fault and coincident with a gold soil anomaly along a 7km long strike. Drill hole locations and results are shown on in Figure 2 below. 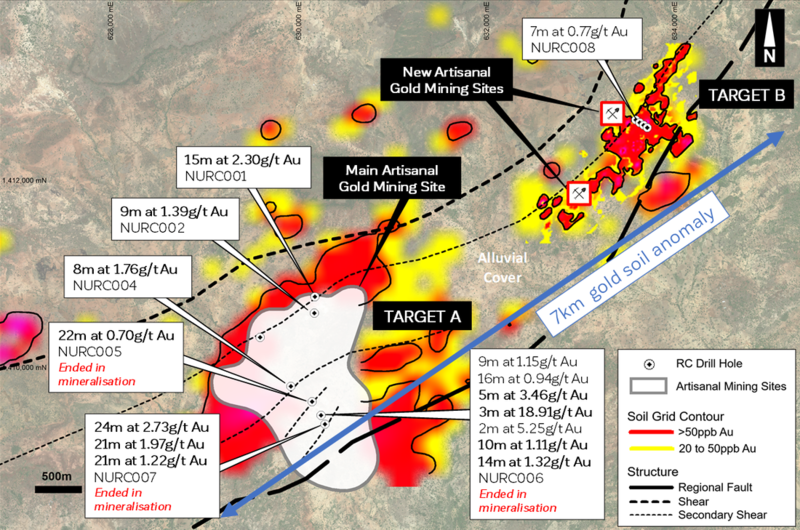 Target A contains a 2km-long by 1km-wide main gold artisanal mining site (shown in white in Figure 2), where artisanal miners are mining to depths up to 50m suggesting high-grade mineralisation is present in the area. Six of the 7 holes drilled within Target A host significant gold intersections with multiple mineralised intervals within each hole. Individual 1m samples assayed up to 53.80g/t Au and separately widths up to 24m at 2.73g/t Au were intersected. Gold mineralised intervals are interpreted as sub-vertical shear zones oriented northeasterly along the 7km gold soil anomaly. The discovery was a result of methodical exploration completed by Mako, including soil geochemical sampling, geological mapping, rock chip mapping and airborne geophysics.